Elizabeth Farm was home to wool pioneers, John and Elizabeth Macarthur and is considered the birthplace of the Australian wool industry. It was commenced in 1793 and originally overlooked a farm of nearly 1000 acres stretching from Parramatta Road to the Parramatta River. The house has undergone many changes over time with extensive renovations enveloping the original dwelling. However, parts of the original home have been preserved, making it the oldest European building in Australia. The house is now an innovative hands-on museum inviting guests to experience what it would have been liked to live there during the early 1800s. There are no barriers, leaving you free to explore the house and its contents. You can take a seat and leaf through some old family letters, try your hand at playing the piano or relax on the veranda. Elizabeth Farm was named after Elizabeth Macarthur. It began its life as a three-roomed brick cottage but was transformed into a smart 15-room country house in the 1820s. Rather than building a two storey mansion, the Macarthurs opted for a single story ‘Indian Bungalow’ design with deep, shady verandas. 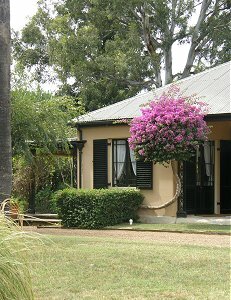 This style soon caught on and became the basis for the design of the typical Australian homestead. The interior features sophisticated cedar joinery, plasterwork and finishes and refects John Macarthur’s taste for classical design. The 1830s garden has been recreated based on paintings from the time. Unfortunately much of the original garden was lost in the various sub-divisions and selling off of land. However, two hoop pines remain in front of the house. Also, grey-leaved fruiting olives that were possibly planted by Macarthur in 1805 can still be found in the garden and are among the oldest surviving exotic plants in Australia. Other surviving trees include bunya pines and kurrajongs. John Macarthur was an influential and colourful character in Australia’s history. While known as the father of the Australian wool industry, his life was also littered with trouble and conflict. He arrived in Sydney with his wife Elizabeth and their 15 month old son with the second fleet in 1790. He was a military man and came to Sydney as a lieutenant of the New South Wales Corps. He was quarrelsome and often involved in petty disagreements and his behaviour soon led to a reprimand from Governor Phillip. When Governor Phillip left the colony, John was appointed regimental paymaster and later inspector of public works. This resulted in a significant pay rise and gave John control over much of the colony’s labour and material resources. During this time, he was stationed at Parramatta and in 1793 he was granted 100 acres of land in the area. He soon established a farm and built a home. The family moved in November 1793. Over the coming years, John continued building his farming enterprises but his public life remained troubled. He clashed with Governor Hunter and later with Governor King. This led to his arrest and transportation to a court martial in England in 1801. He was not convicted and was ordered to return to the colony. While in England, John took advantage of the short supply in the British wool trade to promote colonial wool. He aroused much interest and established himself as the colony’s representative of the industry. When he returned to the colony he resigned from the army. He imported marino sheep from Spain and began building Australia’s wool industry. The following years were not without incidence. His involvement in The Rum Rebellion of 1808 and the illegal arrest of Governor Bligh led to a period of exile in England. During this time Macarthur continued promoting the sale of colonial wool and campaigned to return to Australia. Meanwhile, Elizabeth Macarthur continued to run his affairs back home. In 1817, after eight and half years, Macarthur was granted permission to return to New South Wales on the condition that he no longer participated in public affairs. Over the coming years, Macarthur found great success with his wool exports. The prices in London continued to rise and he was awarded several prizes for the quality and quantity of his wool. The size of his land holdings grew and the family’s fortune was established. He undertook extensive renovation and building projects at Elizabeth Farm and at other sites he owned. He developed one scheme after another, but saw few of them through to fruition. He would enter frenzied periods of planning and building but these would be followed by bouts of severe depression when many plans were abandoned. His sanity soon came into question and in 1832 he was pronounced a lunatic. He died at Camden in 1834. John Macarthur’s extensive remodelling of the house was not finished until after his death. Elizabeth continued living in the home with her daughters until her death in 1850. The family retained ownership of the home for many years. Finally, in 1881 it was sold to Septimus Alfred Stephen. Stephen subdivided the land and put the house block up for auction in 1883. The house was home to several different occupants until 1904 when it was purchased by William Swann. Swann undertook extensive repairs and in 1905, his family moved in. The Swann family is credited with preserving much of the original character of the house. They lived in the house and kept it in good repair, but changed very little. When the family sold the house to the Elizabeth Farm Museum Trust in 1968, it still retained the charm that Elizabeth Macarthur had known. Elizabeth Farm is now maintained by the Historic Houses Trust. The furnishings are simple and in many cases are modern replicas of what may have been there during the time of the Macarthurs. As a result, you have much more access to the rooms than in most house museums. The intention was not to exactly replicate the original furnishings but to demonstrate how the rooms would have been used. It is hoped that this will allow you to experience what life must have been like in the 1800s. General admission is $8.00 Au for adults, $4.00 Au for children or $17.00 for families. Admission is free with a See Sydney Card. Elizabeth Farm is located at 70 Alice Street, Rosehill (near Parramatta), about 40 minutes west of Sydney’s CBD. It is easily reached by car or public transport. If arriving by public transport, take the train to Parramatta Station or the River Cat from Circular Quay to Parramatta. From there it is approximately a 20 minute walk or a short bus ride on bus #547 or Transit First Bus #909. Alternatively, take the train to Rosehill Station (on the Carlingford line) or Harris Park Station. Parking is available in Alice Street. Nearby attractions include Experiment Farm Cottage, Hambledon Cottage and Old Government House. Elizabeth Farm is open Friday to Sunday from 9:30am-4:00pm (daily in January, NSW school holidays and public holidays). It is closed on Christmas Day and Good Friday. There is a small book store on site. Most of the farm is wheelchair accessible. Only the kitchen and cellar are not wheelchair accessible. You can contact Elizabeth Farm directly on (02) 9635 9488. Have You Visited Elizabeth Farm? Please share your experiences of or questions about Elizabeth Farm in the comments box below. This entry was posted on Tuesday, May 10th, 2011 at 3:30 pm	and is filed under Historic Sites, Parramatta. You can follow any responses to this entry through the RSS 2.0 feed. You can leave a response, or trackback from your own site. I just like the helpful information you provide on your articles. I will bookmark your weblog and check once more right here frequently. I am somewhat sure I’ll learn lots of new stuff proper right here! Best of luck for the following! I just like the helpful information you provide to your articles. I will bookmark your blog and check again right here regularly. I am rather certain I’ll learn lots of new stuff right right here! Best of luck for the next!